With water that nourishes life always associated with the best of homes, the Harbor View condominium understandably stands high among the options in condos for sale in Sarasota, Florida. This property is one of the fifteen-or-so real estate developments at the Golden Gate Point peninsula which take advantage of the area’s direct access to the Sarasota Bay and the abundant points of interest in the city’s waterfront and downtown districts. Built in 1962, this condominium is a mid-rise ably competing for attention among the condos for sale in Sarasota which, in particular, started proliferating in the Golden Gate Point Peninsula starting from the 1990s. Harbor View underwent a complete renovation in 2006, and based on the city/county code, the building is considered as new. The condominium is composed of only fourteen residences sharing the 650 Golden Gate Point address. The price level of sales-listed Harbor View condos for sale starts at around the $800s and tops off near the $2-million mark. The residences have open floor plans, and a 1,837-square-foot end unit with two bedrooms and three baths can be a tempting proposition with its tag price hovering around the low $800s. One of the prized condos for sale at Harbor View can be its penthouse with an asking price of around $1 million for its three bedrooms and two baths within a total floor area of almost 2,800 square feet. To aficionados of water-based leisure activities, the deep-water boat docks in the community will certainly be the chief attraction. Boats of up to forty feet can be accommodated at this facility which is a convenient jump-off to the Sarasota Bay and the Gulf of Mexico teeming with many recreational possibilities. 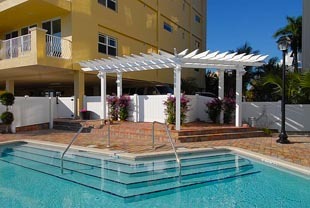 Other condo amenities for relaxation include a fishing pier and a swimming pool. There’s parking under the building and the residents can keep house pets. The North Gulfstream Avenue just off the Golden Gate Point brings the condo residents within minutes to nearby downtown attractions. In addition to the Van Wezel Performing Arts Hall and other centers of culture that Sarasota is famous for, fabulous dining and shopping venues are within convenient reach from Harbor View. 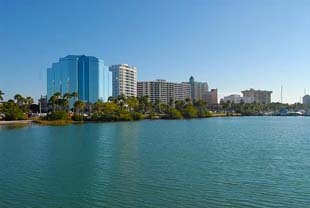 These include those at the St. Armands Circle across the Ringling Bridge and the Westfield Sarasota Square Mall a bit down the South Tamiami Trail. Via the same routes, the superb beaches of Lido and Siesta Keys are also a short drive away to provide more wonderful times in the water. 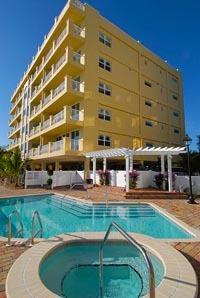 Below are all of the current listings of available condos for sale at Harbor View.